Tomorrow is May Day, but you probably won’t find me dancing round the maypole with joy as it also marks my last day working at Standen. Since arriving in September I’ve met many wonderful people – both staff and volunteers – and learnt a great deal from all of them. I’ve also become overly familiar with the local bus timetable thanks to my inability to drive. The 84 bus stop at the end of the drive. I’m incredibly grateful that Ben and Vicky chose me for this internship and for the knowledge the house team have imparted. The support they’ve given me has allowed me to learn new skills, whether it be checking pest traps with Caroline, inventory marking with Sally, book cleaning with Sarah or packing archives with Lizzie. I’ve also presented my first piece of interpretation that is currently on display in the Butler’s Pantry, so I’m leaving a little reminder of me behind. My Butler’s Pantry display about servants at Standen. My time in the house gave me the opportunity to have a go at actually doing the conservation work I’d previously only read about in books and it is because of this invaluable experience I’ve been able to move on to my new job. On Monday I started as an Assistant Collections Manager at the British Museum with a focus on moving the European ceramic collection to a new storage facility. To make me feel at home, some of the first things I got to handle were De Morgan tiles! This isn’t the last you’ll be seeing of me though. Vicky and I are still working on a paper to present at the Institute of Conservation Conference in Birmingham in June so I’ll back in the near future to analyse the dust we’ve been collecting on our monitoring slides and have a chat over a piece of cake with you all. Categories: Uncategorized | Tags: House Team, Interpretation, Standen, volunteers | Permalink. Eileen has been a room guide with us for 12 years. She volunteered a few years ago to help transcribe a large set of photocopied letters dating from the First World War. Not only did she transcribe many of the letters, she also checked them for consistency and made sure that the formatting was the same throughout – which was no small task! Because of her experience with this she plays a key role in our archive group. 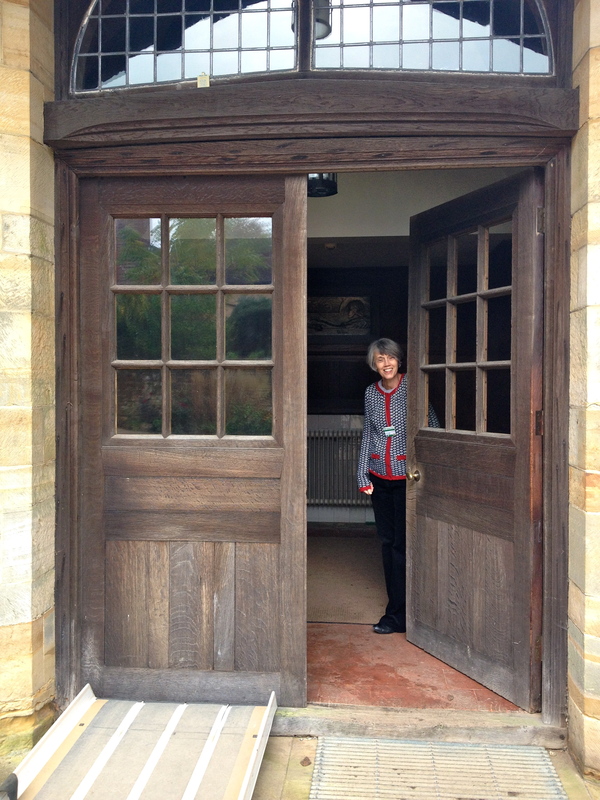 A couple of years ago I joined Standen’s archive group. I have thoroughly enjoyed gaining an insight into the life of the Beale family. I have faced the challenge of deciphering and transcribing a large number of hand‑written letters from about 100 years ago, recently donated by a descendant of the family. 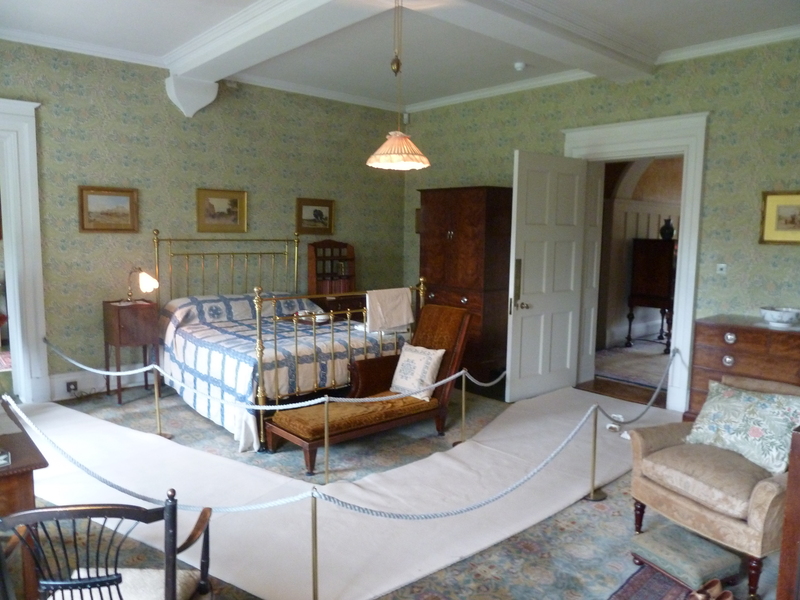 I have learned a lot about the social history of the era, as well as about everyday life at Standen. A historic photo of Standen, similar to those in the recent archive donation. Other tasks that have given me great satisfaction have been examining, discussing, and cataloguing all sorts of objects, documents, and some beautiful family photos, some from as early as the 1880s, many of which were taken by family members who did their own developing and printing. It is satisfying to accurately record details of each item, to provide a resource for the future. a letter describing how Dorothy Brown (née Beale) and her family cycled from their home in Caterham to Standen, in the middle of winter, carrying a violin on a bike. Qualities that shine through are the Beales’ caring attitude and public-spiritedness, their resilience, and their sense of humour. Working on the archives has given me a greater understanding of the family, and given a glimpse into the spirit of Standen. Categories: collection | Tags: Beale, collection, Historic house, Standen, volunteers | Permalink. Why Standen? A room guide’s tale. This week we have a guest post from one of our room guides, Richard. He’s been with us for a couple of years now and consistently gets a round of applause whenever he does an introductory talk, no matter the weather! It was a cold, wet and windy November day when I found myself sat in the house manager’s office at Standen explaining why I wanted to volunteer as a room guide. I remember gushing about how I loved old buildings and finding out about those who lived in them. I told him how I wanted to help bring Standen alive for visitors and share my passion for exploring historic properties. Over 2 ½ years on, I still mean every word I said and believe volunteering here has been the most rewarding “job” I have had. 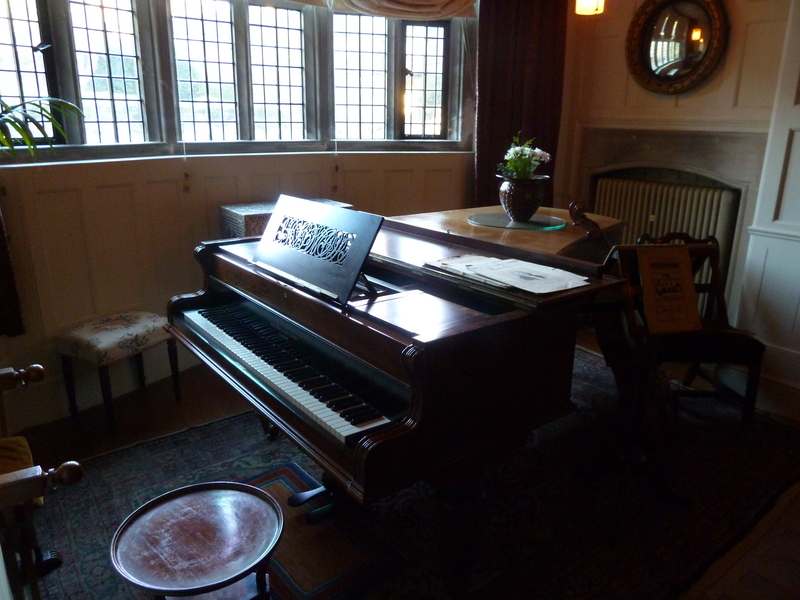 For many years I have enjoyed visiting Standen. Whilst I have always enjoyed the colours and designs inside, I have always loved the way that such a big Victorian house still feels like a warm, inviting, family home. Because only one family have lived here, you get a real sense of a story behind the house and those who lived inside. On my first day I was naturally nervous being surrounded by volunteers who seemed to have an encyclopaedic knowledge of the house and family. But being welcomed with tea and biscuits, I realised that the staff and volunteers are as friendly as the house is; help and advice is always on hand. If you love the National Trust, love spending time in historic houses and love talking to people, volunteer. It is the most rewarding decision I have made. Categories: Uncategorized | Tags: Interpretation, Standen, volunteers | Permalink. Yesterday was the 21st June, the summer solstice and the longest day of the year. It is really the turning point of the year, with summer holidays fast approaching and before we know it will be Christmas! It is also the turning point for me as I near the end of my contract as a Conservation and Interpretation Assistant – this year has just flown by. It feels like it was only yesterday that I started on one of the hottest days of 2014 (fyi – avoid long trousers and a jumper in the future). I have learnt so much from the house team as well as from the volunteers and the visitors. Standen is one of those properties where you can see the results of a strong team in the atmosphere and the high level of detail that is apparent in everything they do, one which I am lucky to have been a part of. Also one that I look forward to continuing working with in the future. So last year my predecessor, Hannah, left to be Assistant House Steward at Stourhead. I am not so much leaving as changing role. So from this week, I shall be the Conservation and Engagement Assistant here in the house. This blog through which I have shared my experiences, will become more of a collaboration between the house team and will give you more of an in-depth insight into Standen. Vicky, our House Steward, will be taking over and ensuring that we share some of the stories and tasks that are involved in the day-to-day running of the house. Categories: Uncategorized | Tags: Arts & Crafts, collection, conservation, Conservation and Engagement Assistant, Conservation and Interpretation Assistant, Hall, Hannah, House Team, National Trust, Standen, summer solstice, the turning point, visitors, volunteers | Permalink. One of the most important jobs that we do here as staff, is to ensure that our volunteers are happy and enjoying what they do for us. We do this mostly through front of house duties. Doing front of house basically means ensuring that the house runs smoothly on a daily basis. This is a role that we split between myself, the Assistant House Steward, House Steward and House Manager. We start off the day with a briefing. This is to update everyone, staff and volunteers, on things that are happening that day, such as if there are any groups coming or if there is a new exhibition starting. It also means that any information from other departments like the garden team, are passed on to keep everyone updated, such as updates on the Garden Revival project. We also let each volunteer know what room they are guiding in for that shift. Once we are open, we will go around the house and see how the room guides are doing – It gives me an excuse for a quick catch up as well. We are also on hand to answer any queries or requests that the room guide feels unable to answer fully or generally lend a hand if it is busy. Front of house does bring its own challenges especially with us being open 363 days of the year now. Often I find myself going from room to room covering tea breaks or covering the room whilst the guide goes and does an introductory talk – one of my favorite rooms to cover is the Larkspur Bedroom and Dressing Room. However this does give me the opportunity to connect with our visitors and find out what they like and dislike about the house. Being front of house is always an interesting way to spend the day. Every day is different, with new questions, challenges and demonstrations. I always find that I learn something new, whether from a visitor, volunteer or member of staff. Categories: Uncategorized | Tags: Arts & Crafts, Assistant House Steward, collection, conservation, Front of House, Historic house, House Manager, House Steward, House Team, Larkspur, Larkspur bedroom, Larkspur Dressing Room, Learning, National Trust, room guide, room steward, Showroom, Standen, visitors, volunteer, volunteers | Permalink. 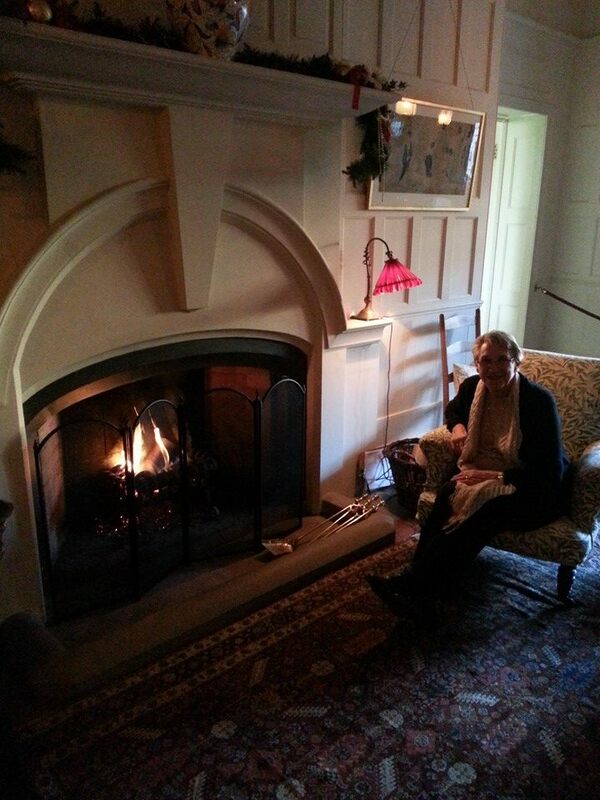 This winter, we have been able to light the fire in the Hall for the first time in over 40 years. But there are always a few things that need to be checked before lighting a fire in such a historic and unused fireplace. Chimneys need to be swept regularly so that the flues remain clear of soot, debris and birds nests (especially in unused ones – see previous posts about birds coming down the chimneys in the bedrooms upstairs here). Also they need to be swept so the gases can escape safely out of the top of the chimney as opposed to building up and causing a chimney fire. All of this will help to increase the chimney’s ability to draw the smoke up instead of out into the room and generally help to keep the fire going. Much like in the song in ‘Mary Poppins‘, brushes are still used today – technology has not changed that much due to the confines of space in the chimney, the main change has been that vacuums are used in some to help get rid of build ups of soot and tar. The brush are twirled upwards to dislodge any soot and tar until the brush pokes out the very top of the chimney. A series of poles are used to extend the brush to make it long enough. One of the other jobs that needed to be done, was to line the chimney. If a chimney is not lined and burns wood, tar builds up on the inside and eventually seeps through the walls leaving black/brown stains. If lined incorrectly, the flue can also start to leak smoke and fumes such as carbon monoxide as well as leading to poor updraught. 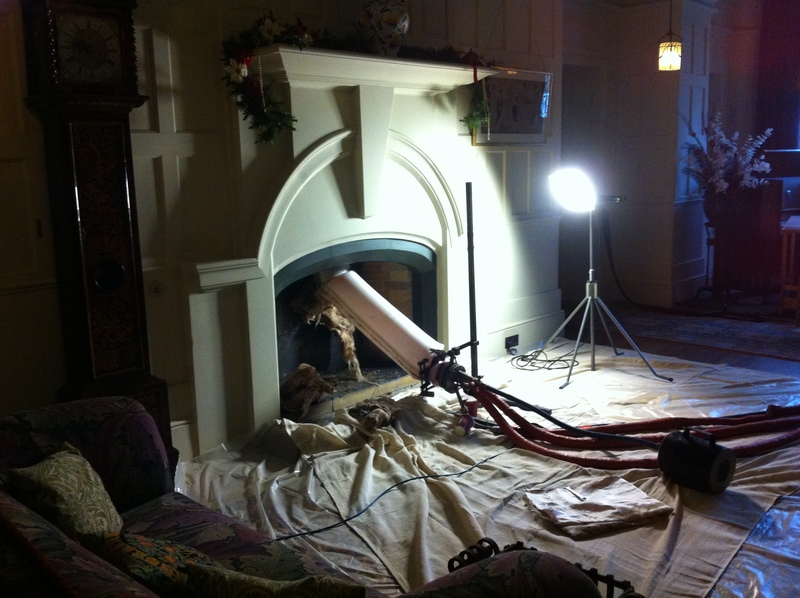 The main reason that we got the chimney lined was a precaution against moisture and tar leaking through the walls. Also as it was last used in 1972, we needed to make sure that the chimney would draw well. We have been lighting the fire every weekend in December and will do so over the 27th and 28th December if you would like to come and have a sit down by it (House open 11am – 3pm). You will be very welcome to. Categories: Uncategorized | Tags: Arts & Crafts, Beale, character, chimney fire, Christmas, cleaning, Fire, Fireplace, Hall, Historic house, National Trust, room guide, room steward, Showroom, Standen, visitors, volunteers | Permalink. Every year the house is decorated for Christmas in either a Victorian or 1920s style and you all get to come in and see the finished product. But not this year; if you come to visit in the next two weeks we will still be dressing the house up for the festive season. 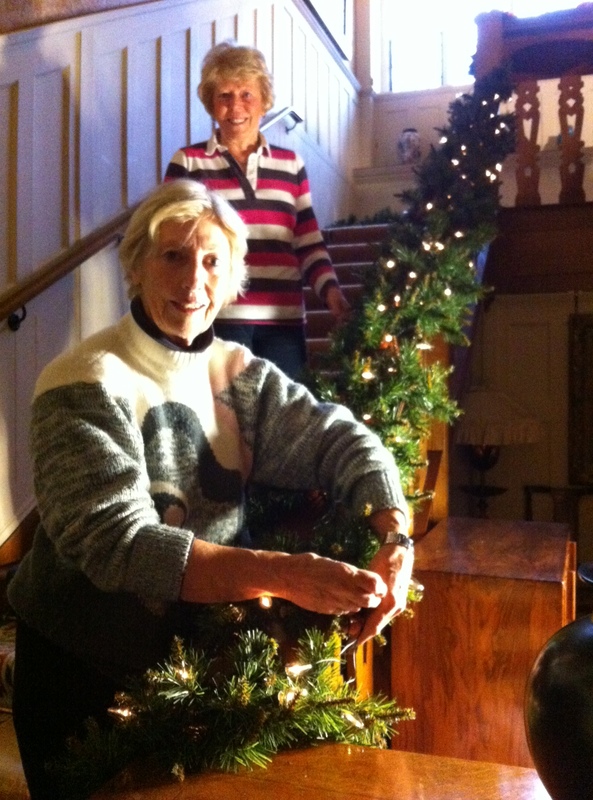 Two ladies, Jan and Sue, from our volunteering team are in charge of organizing who does what when as well as being the first ones in to decorate. We do take pictures of what was done the previous Christmas, especially regarding the placement – and decorations – of the Christmas tree but mostly Jan and Sue rely on their memories of what worked – and did not work – from the previous year. Christmas in the 1920s was similar to today – although not as commercialized. The children eagerly await the arrival of Father Christmas and their presents. Christmas trees were put up and lit with real candles – tinsel was even used though it looked more like long strands of silver and gold. Whole families would gather together, attend Church and have a big Christmas meal – though you were more likely to find beef on the table instead of turkey. 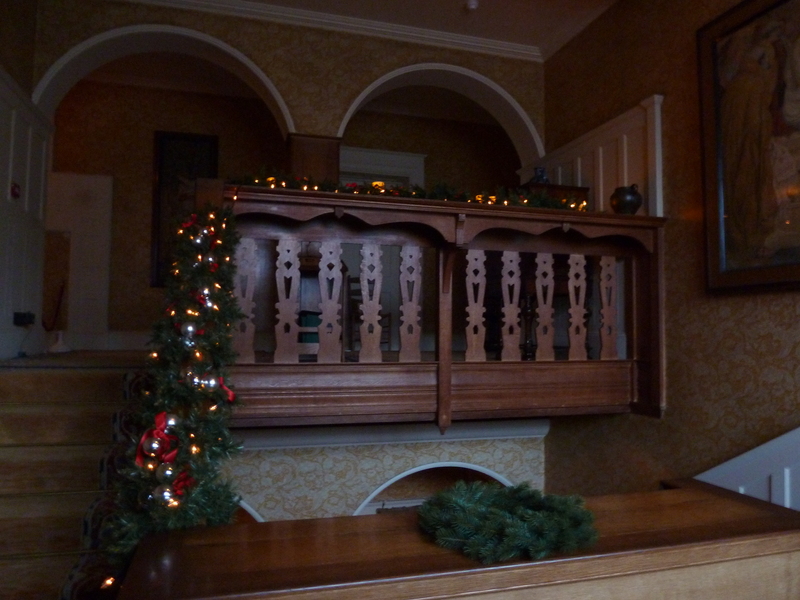 Branches and leaves were used to decorate the house inside and out as well as Christmas Wreaths on the doors. For the Beales, Christmas was a time to gather together. Mr Beale (and later one of his sons) would dress up as Father Christmas whilst the children would hide in the Hall. Father Christmas would then sneak into the Drawing Room, clatter the fire tongs and the children would come running in to see him, most especially to see what presents they were getting. 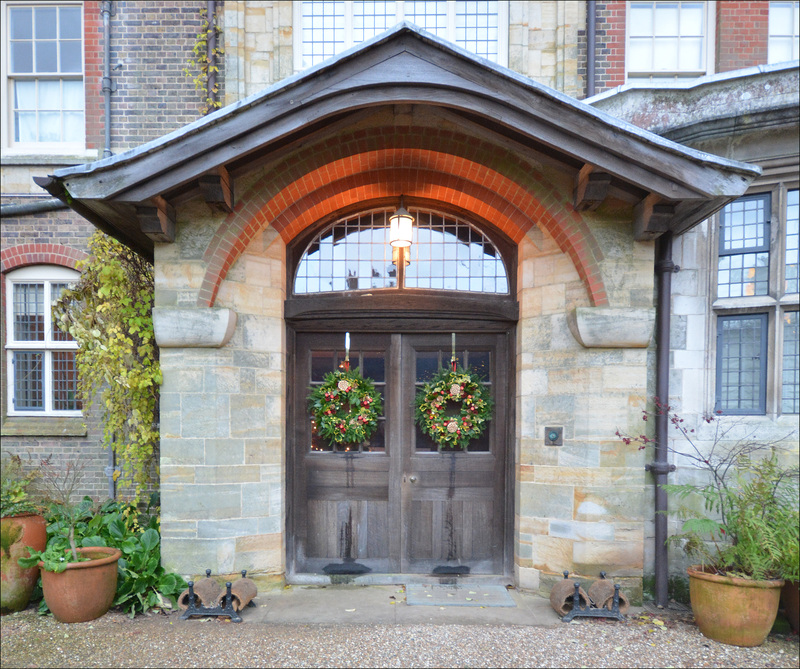 Later in the life of the Beale family, Christmas became one of the few occasions for the family to gather at Standen. Categories: Uncategorized | Tags: Beale, bows, candles, Christmas, Christmas tree, Christmas trees, Christmas Wreaths, Drawing Room, Festive, House Team, lights, National Trust, November, Staircase, Standen, tinsel, volunteers, wreaths | Permalink. What goes on in January?